Have you tried a Blueberry Muffin Microwave Mug Cake Yet? Have you tried a Blueberry Muffin Microwave Mug Cake yet? It’s one of my favorites. Although I’m the inventor of 101 recipes for microwave mug cakes, and I’m not supposed to play favorites, the Blueberry Muffin Microwave Mug Cake is, indeed, the one I bake more often than not when I want a quick snack. I usually have most of the ingredients in the pantry, and to me, eating a Blueberry Muffin Microwave Mug Cake is like going out to a doughnut shop without leaving home. 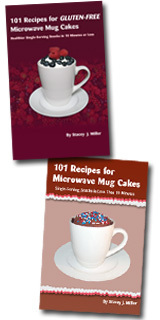 Plus, a Blueberry Muffin Microwave Mug cake is always freshly baked, warm, and ready. Try the recipe and let me know what you think. You’ll find the recipe for a Blueberry Muffin Microwave Mug Cake right here. This entry was posted on Thursday, October 29th, 2009 at 8:37 am	and is filed under microwave mug cakes. You can follow any responses to this entry through the RSS 2.0 feed. You can leave a response, or trackback from your own site.